Patient forms for scheduling an appointment with Alejandro Badia, M.D. I do hearby consent to any medical care which is deemed advisable or necessary by my healthcare provider and grant authority to Badia Hand to Shoulder Center, to administer and perform all examinations, treatments, diagnostic procedures and surgeries needed now or in the future. I guarantee payment for all services rendered. 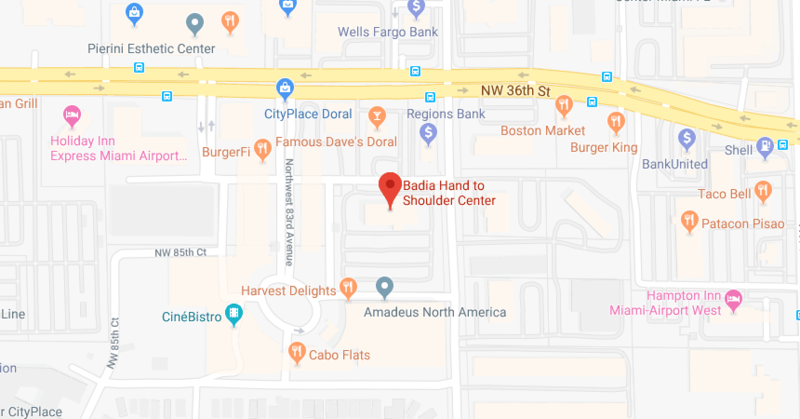 All medical benefits including major medical benefits, private insurance, and any other health plan, are assigned to Badia Hand to Shoulder Center. The signature below confirms all of the information provided herein is true and accurate. Photocopy of this consent is to be considered as valid as the original. This is an agreement between Badia Hand to Shoulder Center, as creditor, and the Patient/Debtor named on this form. By executing this agreement, you are agreeing to pay for all services that are received. Payment is expected at the time services are rendered. We accept cash, personal check, money order, cashier’s check, Visa and Master Card. We collect copay, coinsurance and any deductible at the time services are rendered. Insurance: Insurance is a contract between you and your insurance company. We will file insurance claims only for plans with whom we have a contract with. We participate in some managed care plans. In order to file your claims, we require a legible copy of the front & back of the insurance card, photo ID, social security number and verification of benefits by your insurance company prior to visits. It is the responsibility of the insured/patient to supply current and accurate information for claims submissions. All copay, coinsurance and deductibles are due at the time services are rendered. If you are covered by a plan that we are not participating providers for, payment is expected when services are rendered. We will provide you with an itemized receipt for you to file with your insurance. Your insurance company will be responsible for reimbursing you for any coverage you may have. Collection fee: A fee totaling 30% of the balance due will be added to your account if we have to send your account to a collection agency. You give us permission to check your credit and employment history and to answer questions about your credit experience with us. We have the option to report your account to any credit reporting agency such as a credit bureau. Waiver of confidentiality: You understand that if this account is submitted to an attorney or collection agency, if we have to litigate in court, or if your past due status is reported to a credit reporting agency, the fact that you received treatment at our office may become a matter of public record. Returned checks: There is a fee currently of $25.00 for any checks returned by the bank. Payment made on a returned check must be made in cash or by a money order. Copying of records: You will need to request in writing, and pay a reasonable copying fee ($1/page for the first 25 pages and 25 cents for every page thereafter) if you want to have copies of your records sent to another doctor or organization. You authorize us to include all relevant information, including your payment history. If you are requesting your records to be transferred from another doctor or organization to us, you authorize us to receive all relevant information, including your payment history. Copies of images (x-ray, MRI) are available in CD and are subject to a $10.00 fee per disc. Consent to photograph: I authorize Badia Hand to Shoulder, LLC and its affiliates to take pictures of my (or my child’s) medical or surgical procedure(s) and condition(s) and to the use of such pictures for treatment, scientific, educational or research purposes. My signature below certifies that I have read (or the form has been read to me) and I understand the contents on this form. I hereby acknowledge that I have received a copy of Badia Hand to Shoulder Center Notice of Privacy Practices as required by federal law. I authorize Badia Hand to Shoulder, LLC and its affiliates to take pictures of my (or my child’s) medical or surgical procedure(s) and condition(s) and to the use of such pictures for treatment, scientific, educational or research purposes. (“patient”). The Physician takes pride in being able to extend a greater degree of privacy than is required by law. Federal and State privacy laws are complex. Unfortunately, some medical offices try to find loopholes around these laws. For example, physicians are forbidden by law from receiving money for selling lists of patients or medical information to companies to market their products or services directly to patients without authorization. Some medical practices, though, can lawfully circumvent this limitation by having a third party perform the marketing. While personal data is never technically in the possession of the company selling its products or services, the patient can still be targeted with unwanted marketing information. Physician believes this is improper and may not be in the patient’s best interest. Accordingly, Physician agrees not to provide medical information for the purposes of marketing directly to Patient. Regardless of legal privacy loopholes, Physician will never attempt to leverage its relationship with Patient by seeking Patient’s consent for marketing products for others. We want your feedback. If our office gets it right, tell us. If we could do something better, tell us. We take quality improvement seriously. While there are scores of “rating sites” in cyberspace, many fail to provide useful information. Let’s get it done right. We can make recommendations as to which sites follow minimum standards for fairness and balance. Just ask us. Physician has invested significant financial and marketing resources in developing the practice. Nothing in this Agreement prevents a patient from posting commentary about the Physician – his practice, expertise, and/or treatment – on web pages, blogs, and/or mass correspondence. In consideration for treatment and the above noted patient protection, if patient prepares such commentary for publication on web pages, blogs, and/or mass correspondence about Physician, the Patient exclusively assigns all Intellectual Property rights, including copyrights, to Physician for any written, pictorial, and/or electronic commentary. This assignment shall be operative and effective at the time of creation (prior to publication) of the commentary. This agreement shall be in force and enforceable for a period of five years from Physician’s last date of service to Patient. As a matter of office policy, Physician is requiring all patients sign the Mutual Agreement so as to establish that any anonymous or pseudonymous publishing or airing of commentary will be covered by this agreement for all Physician’s patients. Further, this agreement will survive for a minimum of three years beyond any termination of the Physician-Patient relationship. Patient and Physician acknowledge that breach of this Agreement may result in serious, irreparable harm. Patient and Physician agree to the right of equitable relief (including but not limited to injunctive relief). Should a breach of this Agreement result in litigation, the prevailing party in the litigation shall be entitled to reasonable costs, expenses, and attorney fees associated with the litigation. "Physician" shall be understood to mean Alejandro Badia, M.D. / Badia Hand to Shoulder Center. Further, I understand that I am entering into a contractual relationship with Physician for professional care. I further understand that meritless and frivolous claims for medical malpractice have an adverse effect upon the cost and availability of medical care, and may result in irreparable harm to a medical provider. As additional consideration for professional care provided to me by Physician, I, the patient/guardian and/or my representative agrees not to advance, directly or indirectly, any false, meritless, and/or frivolous claim(s) of medical malpractice against Physician. Furthermore, should a meritorious medical malpractice cause or cause of action be initiated or pursued, I and/or my representative agree to use American Board of Medical Specialties (“ABMS”) board-certified expert medical witness(es) in the same specialty as Physician. Furthermore, I agree that these witnesses will be members in good standing of, and adhere to the guidelines and/or code of conduct, defined for expert witnesses by the ASSH and AAOS. In further consideration for this, Physician agrees to the same stipulations. Patient/guardian and Physician acknowledge that monetary damages may not provide an adequate remedy for breach of this Agreement. Such breach may result in irreparable harm to Physician’s reputation and business. Patient/guardian and Physician agree in the event of a breach to allow specific performance and/or injunctive relief. Successful treatment depends not only on the skill of your physician, but on the commitment, attendance and efforts of you, the patient, as well. At Badia Hand to Shoulder Center we pride ourselves on working with our patients in a timely manner so that the treatment process has the most minimal impact on our patients’ precious time. In addition, your timely attendance is important to facilitating short wait times and optimal patient flow. The staff at Badia Hand to Shoulder Center is committed to accommodating your scheduling needs. In return, Badia Hand to Shoulder Center expects 24 hours’ notice prior to rescheduling or canceling an appointment. Any appointments cancelled or rescheduled without 24 hour notice will be assessed a $50.00 fee. This fee also applies to appointments in which a patient fails to attend or call. Our office has set this time aside to accommodate the schedule, and without proper notice, we are unable to provide the opportunity to another patient who may have requested the same time. For workers compensation patients, should your workers compensation insurance refuse to pay this fee due to your negligence, you will be responsible for this fee. I have read the cancellation policy and understand that I will be responsible to pay a cancellation/no show fee of $50.00 as indicated above. I authorize Badia Hand to Shoulder Center to charge a one-time fee of $50.00 to the credit card on file for each appointment missed. I understand that I will not be informed prior to this fee being charged to my account. I understand that if I give at least 24 hours advanced notice of cancelling an appointment, this fee will not be charged from my account. I understand that if I do not provide my credit card information to Badia Hand to Shoulder Center, I will still be responsible for this fee, and will be billed for this fee. 1. Is your problem the result of an injury or accident? 9. Is the problem getting better or worse? 10. What makes the symptoms worse? 11. Are there any other symptoms associated with this problem? Have any direct relatives had any of the following disorders? If no, what date did you last work? Do you have a personal history of any of the following?